The C320 is binaural (over both ears) and the microphone can be worn on either side. It offers fantastic value for money. This is a USB only headset and cannot be used or adapted for use with a desk or mobile phone. It has inline controls to control volume and mute the microphone as well as an answer button for use with most softphones. A great budget option for anyone looking to use a corded headset with a softphone, with Skype, webinars, listing to audio files and videos etc. It has Dynamic EQ technology which means it will optimise sound whether used for voice, music or multi-media. 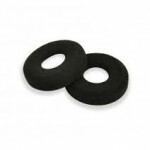 This Blackwire model has a lightweight metal headband and soft foam ear cushions. 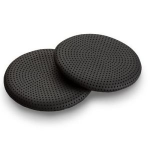 The noise cancelling microphone cancels out most background noise for the person you are speaking to and wideband audio together with DSP gives the best possible sound quality. As you'd expect from Plantronics, SoundGuard® protects the user from loud noise spikes. The next model up in the Blackwire range is the Plantronics Blackwire C520 . which has additional features, a padded headband and folds flat to go into its included carry case. Also worth a look is the Jabra Biz 2300 USB Duo and the Sennheiser SC 60 USB CTRL Corded Headset . Enter UC with the best-featured headset you never thought your budget could afford. 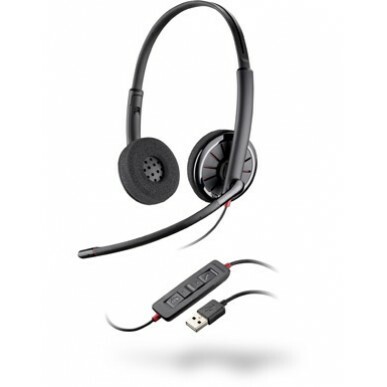 Blackwire 300 Series USB headsets are a simple-to-use, comfortable, and durable choice for conference calls, Web-based training, and PC multimedia applications. Inline controls make it simple to answer and end PC calls and control volume and mute. The lightweight metal headband provides durability while delivering a comfortable and secure fit, while the unique Dynamic EQ feature optimizes sound quality and adjusts settings on the fly, creating outstanding sound for voice, music, and multimedia. The Blackwire 300 Series is ideal for those new to PC telephony as well as organizations looking for a UC solution that's easy to roll out, manage, and upgrade. Two user wearing options: hi-fi stereo for those who want a richer, immersive experience and mono (monaural) for users who prefer to leave one ear open to their environment. Upgradable software ensures compatibility and feature support so you're ready for your next communication steps. Great headset quick and easy to install and very sturdy.